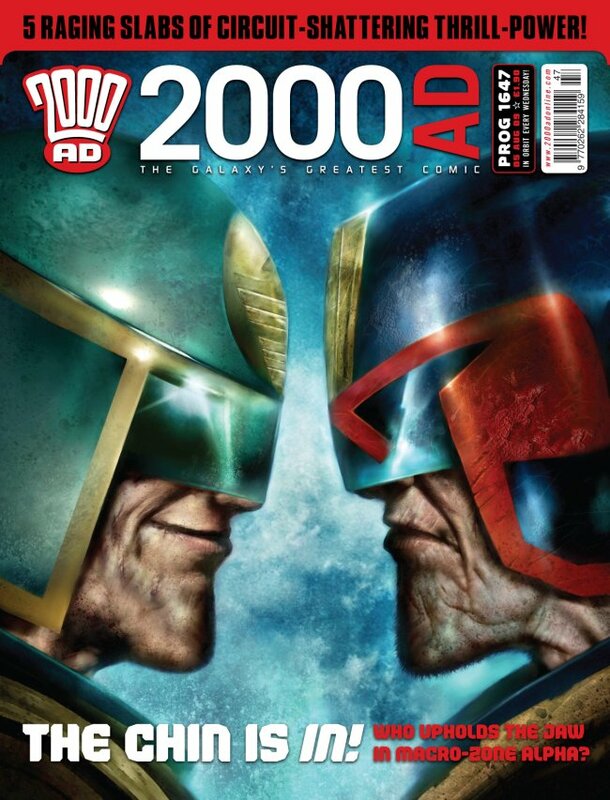 The current American Dredd reprint program from Simon & Schuster has had one angle I don't think earlier ones have tried: the Mega-City Masters series, reprinting Dredd stories from the entire history of 2000 AD, focusing on significant artists (the first and third volumes, which we'll be getting to in, I think, June and August respectively) and writers (this one)--there's not yet any sign of a fourth, or of the double digits of volumes suggested by the title. The writers represented here include almost all of the ones who've spent significant amounts of time with Dredd--with the prominent exceptions of Gordon Rennie and Robbie Morrison--and some of those who haven't. 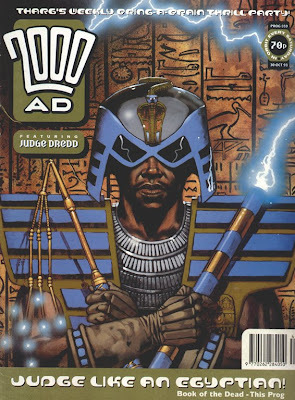 Curiously, this book doesn't include any Megazine episodes either, unlike the other two MCM volumes; that might have made it easier to find some not-overexposed material that showed off various writers to best effect. "Monkey on My Back," anyone? An all-writers showcase--especially for a series that's most strongly identified with two or three particular writers--is an odd idea, but potentially interesting. It's undermined by some peculiar choices, though. I don't know that "That Sweet Stuff" is the strongest choice among Alan Grant's solo Dredds, or that these two Garth Ennis stories really needed another go-'round (not that I mind seeing "The Marshal" again). 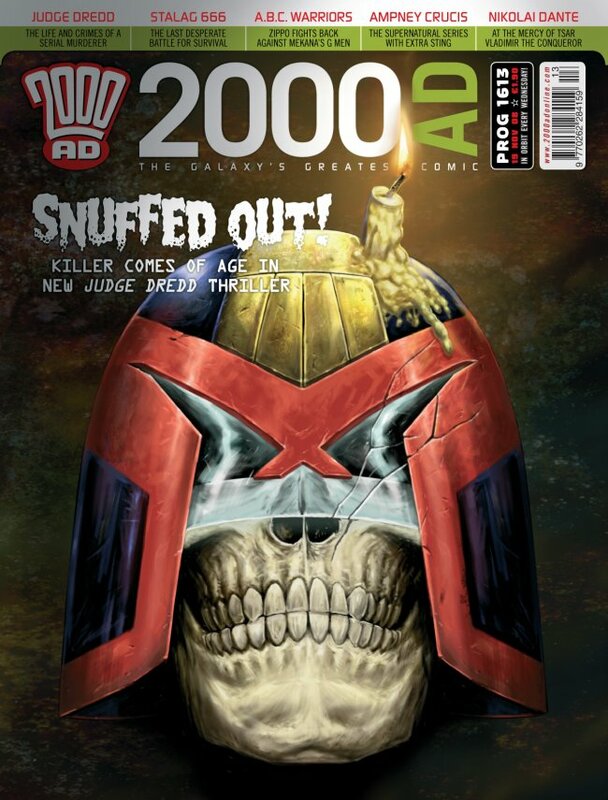 Dan Abnett's published all of four Dredd stories, and "Rad Blood" isn't a particularly good one: it's mostly notable as one of the last few prog appearances by Ron Smith. I'm also enough of a sucker for the Ian Edginton/D'Israeli team that seeing Edginton and Dave Taylor's "High Spirits"--very attractively drawn in Taylor's airy post-Moebius mode, but the kind of handwaving supernatural horror that seems completely off for Judge Dredd--just makes me want to see the trio of one-offs involving H.G. Wells that Edginton and D'Israeli wrote and drew in 2004, 2006 and 2007 instead. Pat Mills hasn't written too many Dredd stories since "The Cursed Earth" that don't involve Satanus, and "Birthday Boy" is a real head-scratcher--a supernatural story that's built on one improbably convenient coincidence after another. (Vince Locke's artwork is also a little wobbly and unruly to fit in with the ordinary look of the series, although it's more appropriate for a horror sequence than a straight-up action piece.) And "Statue of Judgement" is a lesser dartboard-throw choice for a Wagner-written episode, although it's certainly not terrible. Nonetheless, my favorite of the previously uncollected stories here has to be Al Ewing and Karl Richardson's "Rehab," an exceptionally clever five-parter that's totally built on the Wagner template in some ways (and not at all in other ways). The opening scene of its second episode, with the World Politeness Championship, could just about be a lost sequence from "Return of the Taxidermist"; the newscasters' heavy-breathing enthusiasm, the quick Otto Sump ad and the singalongs are all familiar gambits from the Wagner playbook. 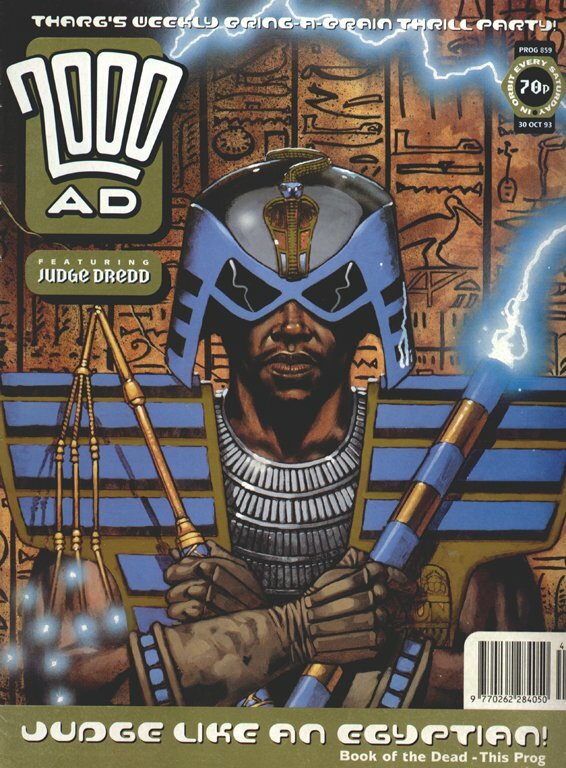 "Book of the Dead" doesn't look as weak as it reads, mostly because Dermot Power has a solid design sense and gave it that lush painted look that was in vogue in 2000 AD then. 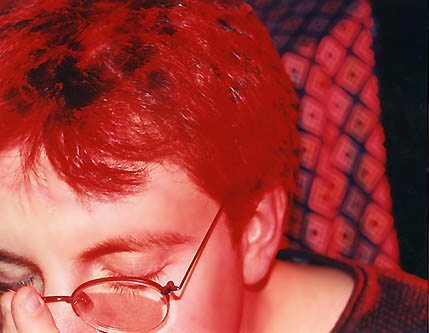 (When was the last painted strip in the prog that wasn't by John Burns? And what was the last painted episode of Dredd? Can it really be, as Barney suggests, "PF" from #1476?) But there's almost nothing in it that's not painfully stupid or an easy gross-out--the toilet paper/mummy gag is some kind of nadir, and resolving the plot with an extended fight scene is a real letdown. Also, the bit about "your genetic material is the purest, derived from the ancient Judda themselves": argh. Even without the later clarification of "Origins"--Eustace Fargo became Chief Judge in 2031, meaning that the Judda as an organization can't be more than, say, 85 years old at the very outside--that's a pretty boneheaded misreading of "Oz." 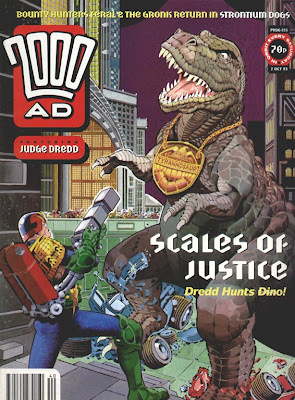 Millar's attitude toward Dredd's satirical elements always seemed to be "it's a bit of a laugh, really," missing the point that the series' best jokes took their silliness seriously. 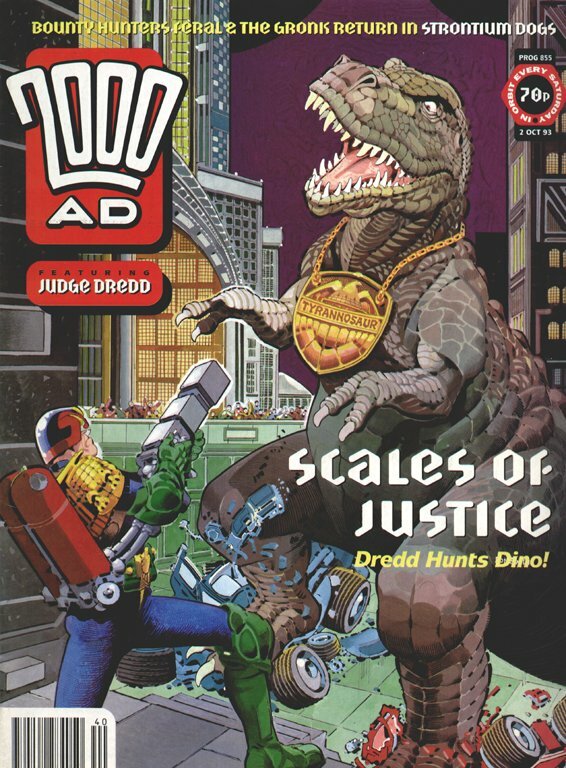 Hence, for instance, "Judge Tyrannosaur," which features some of the most dumbed-down dialogue I've seen outside of Spidey Super Stories. 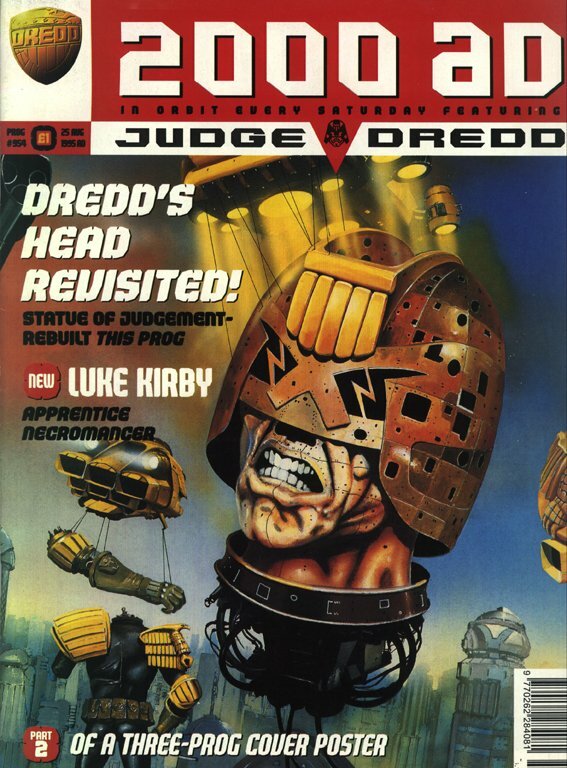 ("Nobody can hide from the law, creep"--next word balloon--"not even in the Cursed Earth!") It's another pretty Ron Smith color job, but it's also a little embarrassing to see the artist of "Bob & Carol & Ted & Ringo" being dragged back to that territory. Smith can't have missed the resemblance, and in fact he draws "Mike Crichton, Jurassic expert" to look exactly like Irrawaddy Skinner from the earlier story. There's a dinosaur in the room, and it's not the older gentleman drawing the story. Next week: wading further into the Morrison/Millar era with Crusade! Well, Barney probably knows better than I do, but wasn't last year's Bryan Talbot's return to Dredd ("Caterpillars", Prog 1730) also painted?